These days I venture out to Roseville only about once every two months. Ever since I left my husband to move downtown, the Roseville/Rocklin area has been an unwelcome reminder of a marriage lost. We had a good marriage that lasted 9.5 years until it fell apart. Gone went the relationship, a great house, and another life. Now when I go out to Placer County I see something new every time. Growth has slowed down, but there is still so much more in terms of businesses and shopping areas. Suede Blue has sat prominently on a hill by the Roseville Automall for some years now. I knew it to be a ritzier restaurant and one that would require an occasion to make me go there. The opportunity arose when I got a half-price deal for them. I used it to take my ex-husband to dinner. We are still friends after an amicable divorce. Upon entering the foyer I noted that the furnishings were on the expensive side. There were beautiful leather sofas with brass nails and lots of pillows for décor. I was distracted thinking how good they would look in place of my current cat-shredded sofa. A group of hostesses greeted us and we were promptly seated. The setting definitely does emit a fine-dining atmosphere with a dark interior, leather booths, and fine fixtures. Our server was prompt and attentive throughout. 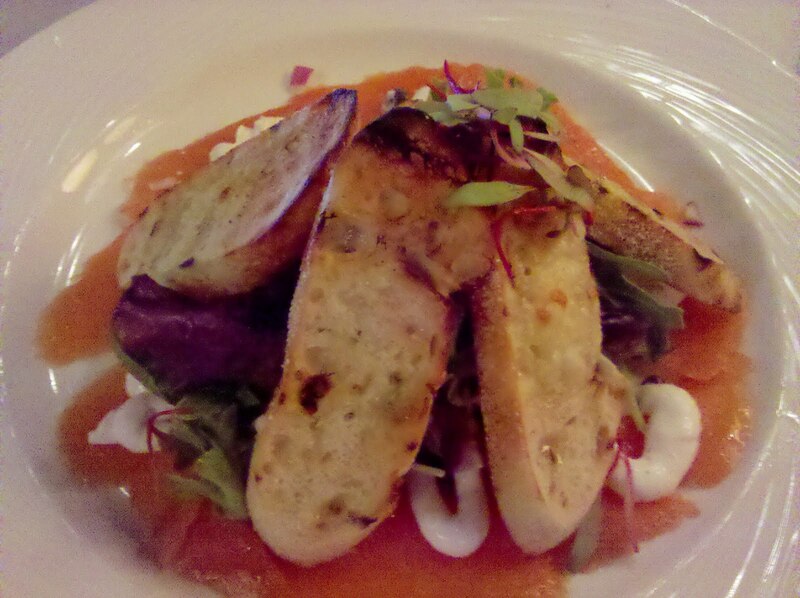 It took us a while to choose an appetizer and we settled on the salmon carpaccio. I knew I wanted a steak for dinner, so the salmon seemed appropriately light. It arrived with enough to be a dinner in itself for my appetite, partly due to the fact that the salmon was thickly sliced. With carpaccio I believe that thin is better. It gives it a lightness that tends to melt in your mouth versus having to chew. There was ample crema and capers along with a center of fresh greens. I had initially intended to have my steak but instead ordered the prime rib. Prime rib is one of those cuts where it can be melt-in-your-mouth good, or it can be tough, chewy, and miserable. Mine was the latter. My medium rare came out almost moving. Even after the server took it back to “dip it in au jus” (how that’s supposed to make it more tender, I have no idea) I was still getting an overall jaw workout. Considering the price, etc, I really should have taken them up on the offer of another dish. But you get in that place where your guest is almost finished with their meal and instead you tough it out rather than wait for a new dish. My mistake and one I regret in hindsight. It certainly looked lovely, but such an ordeal. I took half of it home since I don’t believe in waste. It did get eaten the next day – not that it improved any with age. As my side I chose the potatoes au gratin, which was a nice change from mashed or baked. I really enjoyed the potatoes much more than the meat. The server made it up to us with a free dessert. Although he tempted us with the chocolate lava cake, I went with the easy crème brulee. 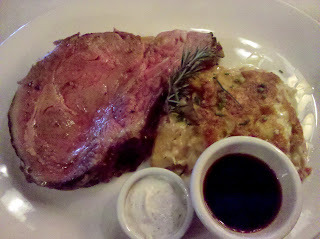 After all, if I didn’t get my decadence in the prime rib, I’d get it out of a good dose of high fat cream. I hate the burnt the sugar on top, I always peel it off, and so the server was kind enough to serve it without going through the exercise of torching it. There was plenty of the tell-tale signs of vanilla seeds, but overall I found the texture a bit on the pasty side. Being one of my favorite desserts, I can be pretty picky and this one was barely satisfactory. 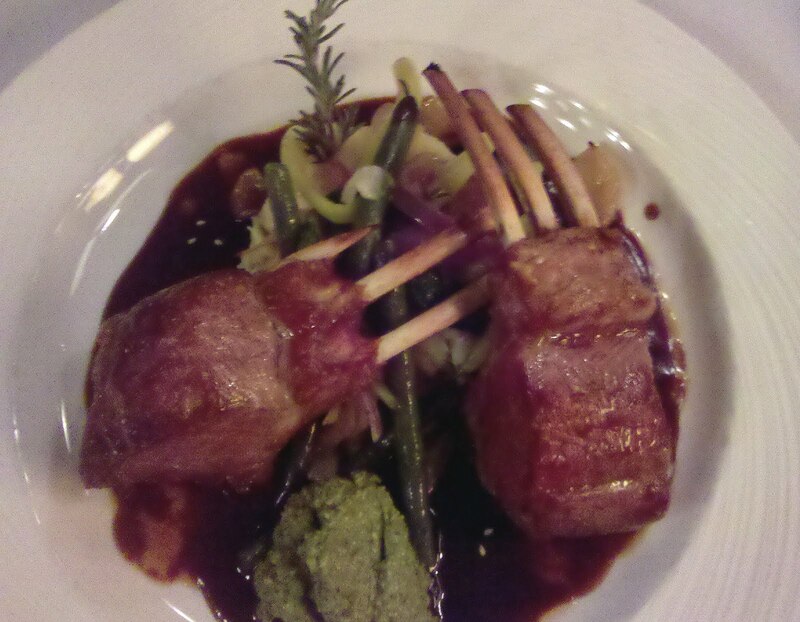 Overall, the setting and the service were wonderful, but the dishes did little to impress me. I was happy that I didn't have to pay price. Would I try them again? Sadly, probably not. Too many other places and when you are so discouraged on a first visit, it does little to entice you back again.